One may get fascinated by the CLT20 that is about to begin …. ..but more important is the Asian Games – the 2014 Asian Games, officially ‘ XVII Asiad’ - the largest sporting event in Asia governed by Olympic Council of Asia (OCA), scheduled to take place in Incheon, South Korea from September 19 – October 4, 2014, with 439 events in 36 sports and disciplines set to feature in the Games. The news is that Sports minister Sarbananda Sonowal, in consultation with Prime Minister Narendra Modi, Tuesday pruned the Indian contingent for the Incheon Asian Games, to 679 from 942 that was proposed by the Indian Olympic Association (IOA). The total number of participants shall be 679, including 516 athletes and 163 coaches and support staff. The IOA had sent a list of 942 participants, including 662 athletes and 280 officials. India will be participating in a total of 28 disciplines as against 35 last time. "In Asiad 2010 in Guangzhou, China, we had sent a contingent of 609 athletes plus 324 officials (933). It has also been decided that 'No Cost to Government' shall not be a consideration for finalizing the national contingent," the ministry said in a statement. The disciplines cleared for the Asian Games are aquatics (swimming), archery, athletics, badminton, basketball, boxing, canoeing and kayaking, cycling, equestrian, football, golf, gymnastics, handball, hockey, judo, kabaddi, rowing, sepak takraw, shooting, squash, taekwondo, table tennis, tennis, volleyball, wrestling, wushu, weightlifting, and yachting …………… what would miss the attention is the fact that India will field a second-string tennis contingent in this month's Asian Games after allowing frontline players, including Leander Paes and Sania Mirza, to play on the professional tours instead to revive their rankings. India's top singles player Somdev Devvarman has already announced he will not defend the singles and men's doubles gold medals he won four years ago in Guangzhou, China, citing the same reason. Veteran Paes, winner of eight men's doubles and six mixed doubles Grand Slam titles, has slipped to 35 in doubles rankings. "Special circumstances have developed where it is necessary for the players to participate in ATP and WTA events to protect their rankings and... qualify for the yearend World Masters," All India Tennis Association (AITA) president Anil Khanna said in a statement on Wednesday. Khanna did not elaborate on any late replacements. AITA secretary Bharat Oza and coach Zeeshan Ali could not be reached for comments either. Sania Mirza, who won the US Open mixed doubles title partnering Brazilian Bruno Soares, pulled out to play in two WTA Tour events instead to keep alive her and partner Cara Black's hopes of making the WTA season-ending championship in Singapore. Well you hear that across the Globe, Nation comes first for many …… one player who should not be criticised is Leander Paes who has done consistently well in all Davis Cup matches representing the Nation ………… he has recently stated that he was yet again ready to take the responsibility of playing a crucial role in the Davis Cup World playoff tie against Serbia which begins on Friday. Commenting on Somdev Devvarman's comment that the tie could hinge on doubles outcome, Paes, who will partner with Rohan Bopanna, said he was ready to take the pressure. He is quoted as stating - "Check the stats. I think I have played with nine generations of Indians. Played with Zeeshan (Ali) in my first tie, in February 1990………… the same cannot be said of all others … !!! The last Asiad took place in Guangzhou, China from November 12 to 27, 2010. Guangzhou was the second Chinese city to host the Games, after Beijing in 1990. Cricket made its debut at the 16th Asian Games 2010 ; in the men's event host nation China, were joined by three of the four ICC Full Members in Asia, Bangladesh, Pakistan and Sri Lanka as well as Afghanistan who played in the 2010 ICC World Twenty20. Due to other international commitments, Sri Lanka, Bangladesh and Pakistan fielded understrength teams whilst India did not participate. Bangladesh defeated Afghanistan in the final event to win the gold medal while the latter won the silver. The bronze went to Pakistan after they beat Sri Lanka in the third-place match. In the women's event China played with ICC Women's Cricket Full Member Pakistan. India and Sri Lanka did not participate. Pakistan won its first cricket gold in women's event while Bangladesh gained a silver. Japan defeated China in the bronze medal match, in what could be a boost for cricket in Japan. 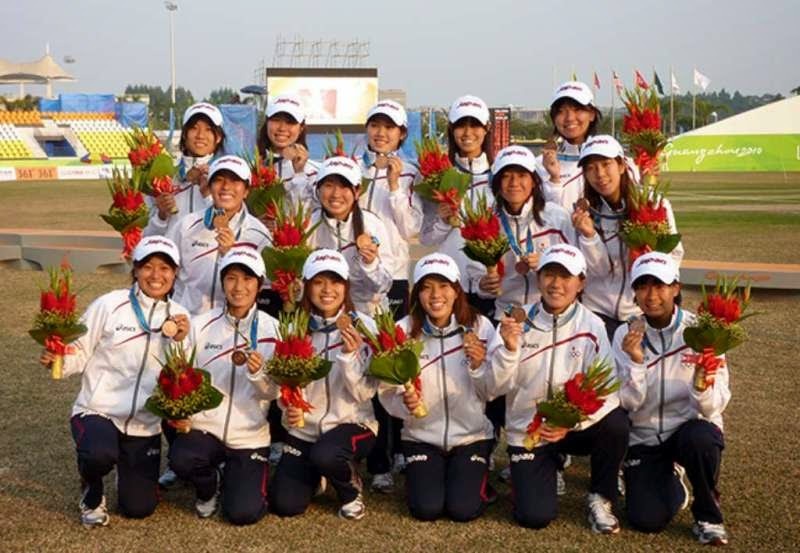 The photo at the start is that of Japanse women's cricket team..
That is what happens in the Cricket crazy country.